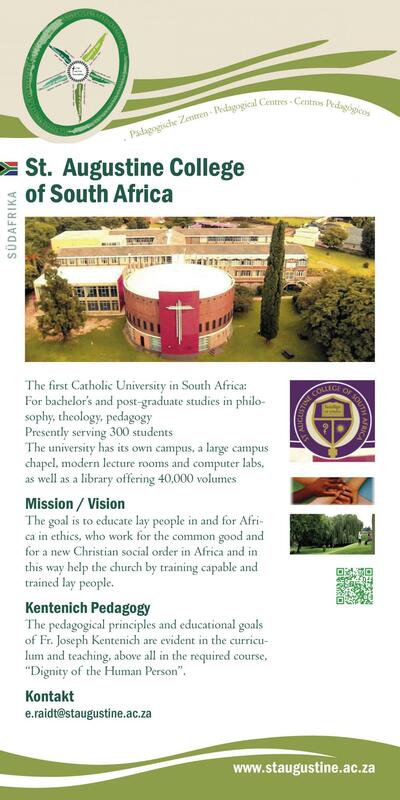 The first Catholic University in South Africa for bachelor’s and post-graduate studies in philosophy, theology, pedagogy Presently serving 300 students. The university has its own campus, a large campus chapel, modern lecture rooms and computer labs, as well as a library offering 40,000 volumes. The goal is to educate lay people in and for Africa in ethics, who work for the common good and for a new Christian social order in Africa and in this way help the church by training capable and trained lay people. Kentenich Pedagogy The pedagogical principles and educational goals of Fr. Joseph Kentenich are evident in the curriculum and teaching, above all in the required course.